I rolled into Minneapolis after a long transit trip from Bulgaria. Having an eight hour layover in Berlin from Sofia, I arrived in Iceland (2*c) around midnight. Iceland, the land of high inflation has it set up that all passengers can take the ‘flybus’ to Reykjavík and be dropped off at your hotel or hostel; the cost was $22.00 one way. I was extremely tired after arriving at the hostel around 2am that cost about $40 a night, not including beds sheets. The next day I visited the capital city of Reykjavík and couldn’t believe the prices for food. The cost of eating out averages $15 to $20 per meal. The Bus was $5 per trip. 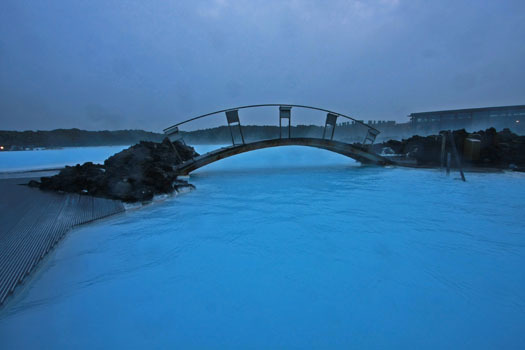 The tourist industry in Iceland has it set up for the holiday-maker to visit the Blue Lagoon on the way to the airport. The transportation from the hostel to the airport via the Blue Lagoon averages $50, not including the robe and towel rental. Yet, I very much enjoyed the Blue Lagoon. The water was wonderful and the area is big enough to get way from the tourist groups and enjoy some quite back floating. There is a semi powerful waterfall within the Blue Lagoon — I thoroughly enjoyed the powerful water crushing down on to my head and shoulders. I entered the waterfall about 10 different times. The Blue Lagoon also provides free facial masks while soaking. I refuse to travel with expectations, so despite the inflated cost, the Blue Lagoon was extremely satisfying; however, many holiday-makers experienced slight disappointment. Gasoline in Iceland averages $8 a gallon. Iceland is a stunningly beautiful place if you enjoy strange and desolate landscapes. Because it is so close to the Arctic Circle, the amount of daylight varies dramatically by season. The sun sets briefly each night in June, but it doesn’t get fully dark before it comes back up again. In the March and September equinoxes, days and nights are of about equal length, as elsewhere in the world. If you go in December, it’s almost 20 hours of darkness. Summer is definitely the best time to go, and even then the tourist traffic is still mild. The midnight sun is a beautiful sight and one definitely not to be missed. It is easy to lose track of time when the sun is still high in the sky at 11PM. Early or late winter, however, can be surprisingly good times to visit. In late January, daylight is from about 10AM to 5PM, prices are lower than in the high season, and the snow-blanketed landscape is eerily beautiful. Despite its name, Iceland has surprisingly mild winters for a country at that latitude owing to the warming effect of the Atlantic Gulf Stream, especially when put into comparison with the Russian one. Iceland enjoys a maritime temperate climate and the winters are often compared with those of New England (though the winds in winter can be bitter). However the rapidly changing weather has given rise to the local saying: ‘If you don’t like the weather, wait fifteen minutes!’ It’s the kind of place where it’s not unusual to get rained on and sunburnt at the same time – some Icelandic people also believe that if the winter is hard and long then the summer will be good and warm. The summers are usually cooler and more temperate than elsewhere at the same latitude (the effect of the ocean again) and 15 to 20°C is considered quite warm. A geologically young land, Iceland is located on both the Iceland hotspot and the Mid-Atlantic Ridge, which runs right through it. This location means that the island is highly geologically active with many volcanoes, notably Hekla, Eldgjá, Herðubreið and Eldfell. The volcanic eruption of Laki in 1783–1784 caused a famine that killed nearly a quarter of the island’s population; the eruption caused dust clouds and haze to appear over most of Europe and parts of Asia and Africa for several months afterward. Iceland has many geysers, including Geysir, from which the English word is derived, and the famous Strokkur, which erupts every 5–10 minutes. After a phase of inactivity, Geysir started erupting again after a series of earthquakes in 2000. Geysir has since then grown more quiet and does not erupt often. With the widespread availability of geothermal power, and the harnessing of many rivers and waterfalls for hydroelectricity, most residents have inexpensive hot water and home heat. The island itself is composed primarily of basalt, a low-silica lava associated with effusive volcanism as has occurred also in Hawaii. Iceland, however, has a variety of volcanic types (Composite- & Fissure), many producing more evolved lavas such as rhyolite and andesite. Iceland has hundreds of volcanoes within approx. 30 volcanic systems active Surtsey, one of the youngest islands in the world, is part of Iceland. Named after Surtr, it rose above the ocean in a series of volcanic eruptions between 8 November 1963 and 5 June 1968. Only scientists researching the growth of new life are allowed to visit the island. On 21 March 2010, a volcano in Eyjafjallajökull in the south of Iceland erupted for the first time since 1821, forcing 600 people to flee their homes. Further eruptions on 14 April forced hundreds of people to abandon their homes. The resultant cloud of volcanic ash brought major disruption to air travel across Europe. Another large eruption occurred on 21 May 2011. This time it is the Grímsvötn volcano, located under the thick ice of one of Europes largest glaciers, the Vatnajökull. It is one of Icelands most active volcanoes. Primarily it had a much more powerful eruption than the 2010 Eyjafjallajökull eruption. Grímsvötn first spew its ashes about 20 km (12.43 mi) up in the atmosphere, about twice as high as the previous year’s eruption from Eyjafjallajökull. A huge ash cloud that could be a danger for flight engines in the northern hemisphere of the world is spreading, and the eruption had not yet stopped as of 24 May 2011.